Altec Lansing outs an ultra-portable speakers, appropriate for use with your laptop or tablet on-the-go. The Orbit USB Stereo speakers , called iML247 feature an interesting, retractable design, with hidden internal cord storage for easy transportation. Despite the small footprint, Altec Lansing claims that the Orbit USB Stereo speakers deliver “perfectly balanced sound with astonishing volume, clarity and depth, thanks to the integration of the company’s Audio Alignment technology. The speakers actually lock into each other and to use them, you simply twist and split apart the two speakers and connect to a computer via USB. They are also equipped with LED power indicator and retractable stands for easy orientation of the sound in any direction. 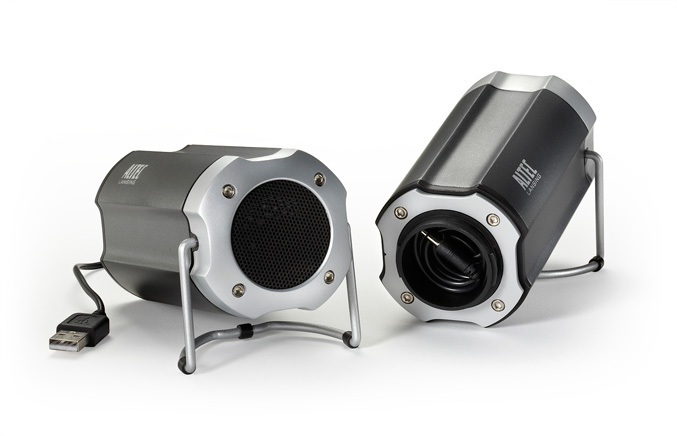 The Altec Lansing Orbit USB Stereo are available for $49.95.